FOX News investigative reporter Catherine Herridge points out two major lies in Hillary Clinton’s testimony under oath before the House Select Committee on Benghazi. ** If there was accountability in Washington DC Hillary would be prosecuted. Hillary Clinton and Barack Obama immediately understood the assault on the Benghazi Consulate was a terrorist attack and was not connected to any YouTube video or a protest. They then went out and repeatedly lied to the American public about the attack. On Thursday, Rep. Jim Jordan (R-OH) revealed emails and transcripts that proved Clinton knew the attacks were driven by terrorists, even while she continued to tell the American people it was a spontaneous, video-driven assault. Hillary told the Egyptian president the following day it was a terrorist attack and not related to the film. Herridge argued the information known about the attack completely contradicts Hillary Clinton’s wildly inaccurate statements. 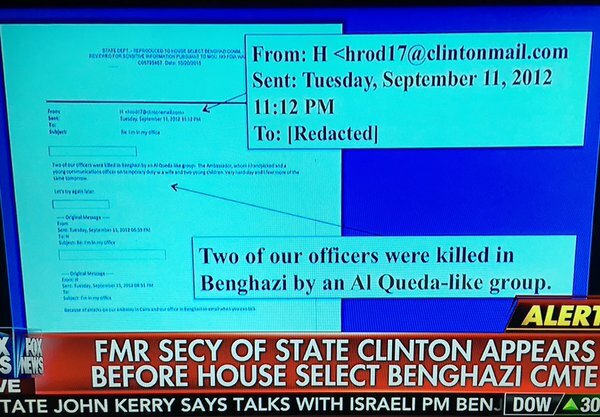 Today Herridge also pointed out that Hillary claimed the Benghazi operation was never in jeopardy. However, documents obtained by FOX News prove this was another lie by Hillary Clinton.